360 pages | 104 B/W Illus. This book is part of a series of titles that are a spin-off of the Shingo Prize-winning book Leveraging Lean in Healthcare: Transforming Your Enterprise into a High Quality Patient Care Delivery System. Each book in the series focuses on a specific aspect of healthcare—including emergency departments, medical laboratories, outpatient clinics, ancillary services, and surgical services—that has demonstrated significant process and quality improvements after a Lean implementation. Because ambulatory care settings play a significant role in the healthcare delivery system, it is important to understand how Lean concepts and tools can be used to deliver high-quality, cost-effective care. Leveraging Lean in Outpatient Clinics: Creating a Cost Effective, Standardized, High Quality, Patient-Focused Operation provides a functional understanding of Lean processes and quality improvement techniques in an outpatient clinic environment. 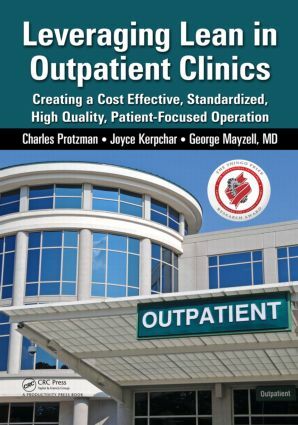 This book is an ideal guide for healthcare executives, leaders, process improvement team members, and inquisitive frontline workers who want to implement and leverage Lean in outpatient clinical settings. Supplying detailed descriptions of Lean tools and methodologies, it identifies powerful Lean solutions specific to the needs of outpatient facilities. The first section provides an overview of Lean concepts, tools, methodologies, and applications. The second section focuses on the application of Lean in the outpatient clinic environment. It presents illustrative examples of Lean deployments in primary care, GI, and preadmission testing clinics. The examples provide broad content which can be readily transferable to other outpatient clinic settings. Illustrating leadership’s role in achieving departmental goals, this book will provide you with a well-rounded understanding of how Lean can be applied to achieve significant improvements throughout the complete continuum of care. Introduction – So What is Lean? What is a Lean Business Delivery System? Why People Love to Batch? Lean and Organizational Change - "Right Seat on the Right Bus"
Does Your Organization have Sacred Cows? What Does All This Have to Do with Hospitals? Cycle Time and Takt Time—What’s The Difference? How do you Find Waste? Why Break Down Types of Storage? Why Make the Operator’s (Staff Person’s) Job Easier? Motion Study—Just When You Thought You Were "There"
How Do We Know When the Layout is Right? Do We Really Need to Add More Rooms or Space? What Parts Do We Kanban? The Lean System Implementation—Are You Ready for It? What Questions Should You Ask When Doing a Gemba Walk? Time Management and the "Fires"
Understanding what a Lean Culture Looks Like—"the People Piece"
How Do You Get the CEO on Board? How to: The Procedure to Create Standard Orders for "Medical Clearance for Surgery"
Traditional Process Flow and Issues of the "Readiness for Surgery Process"
W. Protzman, III, MBA, CPM is a Shingo Prize-winning author and internationally renowned Lean consultant with over 31 years’ experience in materials and operations management. He spent more than 13 years with AlliedSignal, now Honeywell, where he was an aerospace strategic operations manager and the first AlliedSignal Lean Master. He has received numerous special recognition and cost-reduction awards. Charles was an external consultant for DBED’s World Class Maryland Consortium while he was with AlliedSignal. He had input into the resulting World Class Criteria document and assisted in the first three initial DBED World Class Company Assessments. Charles has taught students in Lean principles and Total Quality from all over the world. In November of 1997, Charles Protzman formed Business Improvement Group, LLC (B.I.G.). B.I.G. is located in Baltimore, Maryland and specializes in implementing Lean Thinking. Charles has spent the last 18 years implementing successful Lean product line conversions, kaizen events, and administrative business system improvements (transactional Lean) across the globe. Charles participated in numerous benchmarking and site visits including a two-week trip to Japan in June 1996 where he worked with Hitachi in a kaizen event. He is a Master facilitator and trainer in TQM, total quality speed, facilitation, career development, change management, benchmarking, leadership, systems thinking, high performance work teams, team building, Myers Briggs Styles Indicator, Lean thinking and supply chain management. He also participated in Baldridge Examiner and Six Sigma management courses. He was an assistant program manager during Desert Storm for the Patriot missile-to-missile fuse development and production program. Joyce Kerpchar, PA is a Shingo Prize-winning author and health care expert, with over 30 years of healthcare industry experience and currently serves as a director at Florida Hospital Orlando, which is part of the Adventist Health System, an acute-care, tertiary hospital caring for more than 1.5 million patients a year. She joined Florida Hospital in 2001, and has held a variety of roles, as interim director of strategic for surgical services, director of the Institute for Surgical Advancement, a senior consultant implementing Lean across the eight campuses in a variety of clinical departments, is a Six Sigma Black Belt and is a certified MBTI instructor, product and project manager roles developing and implementing software applications. She began her career as a board certified physician’s assistant in cardiovascular and thoracic surgery and primary care medicine. Prior to joining Florida Hospital, she held a variety of administrative positions in healthcare-related industries, which included managed care operations and contracting for a PruCare/Prudential Healthcare who served 200,000 members in nine counties in Central Florida, Product Management for Avio Corporation, a provider of information technology for ambulatory healthcare organization, and was a partner in a consulting firm which specialized in business and market entry strategy for high tech start-ups. Ms. Kerpchar is passionate about leveraging Lean in healthcare processes, to eliminate waste and reduce errors, to improve the overall quality and reduce the cost of providing healthcare. Dr. George Mayzell, MD, MBA, FACP is the senior chief medical officer and chief clinical integration officer for Adventist Midwest Health. He joined the organization in January 2013 after serving as CEO of Health Choice and senior vice president of Methodist Le Bonheur Healthcare in Memphis, Tenn.
Dr. Mayzell has more than 30 years of experience in medicine and is a board certified internist and geriatrician. He received his medical degree from the University of Medicine and Dentistry of New Jersey and his MBA from Jacksonville University. He previously served as senior medical director of managed care for University of Florida and Shands Hospital. He spent more than 10 years with Blue Cross Blue Shield of Florida, working as regional medical director for care and quality and corporate managing medical director for pharmacy and care. Additionally, he has more than 10 years of practice experience. Mayzell has co-authored two books, Leveraging Lean in Healthcare and Physician Alignment: Constructing Viable Roadmaps for the Future.